Competition affects credit strength, and never more than in tough times. Favorable conditions can mask competitive weaknesses. Consider General Motors at the peak of the SUV craze. Unfavorable conditions can amplify weaknesses. Consider General Motors today. This video is about Southwest Airlines and American Airlines and the recent problems in the airline industry. It explores the subject of sustainable competitive advantage. How does a company get it? How likely is it to last? The video is about four minutes long. Bank Accounting - Rules or Reality? The U.S. accounting authorities are finishing a round of changes to the way banks account for the value of their impaired assets. A number of rules are involved: FAS 114, FAS 115, FAS 124, FAS 157. The combined effect will make it easier for banks to avoid reporting losses on their loan portfolios. There's been a lot of discontent among analysts and in the press about the changes. Critics complain that the new rules make it easier for banks to overstate their capital. The Wall Street Journal warned about "a loophole big enough to fit a bloated bank balance sheet through ("Accounting Rules Should Avoid Impairment," April 1, 2009)." The article accuses the rule makers of allowing a kind of capital arbitrage, where banks keep losses out of regulatory capital but include them in regular shareholders' equity. That's not the case. The new rules will let the banks keep some losses on the fair value of assets out of earnings, but not out of capital or shareholders' equity. Whatever the accounting technicalities, the economic reality of bank capital is difficult to analyze. The regulatory concept of Tier 1 and Tier 2 capital is complex and impossible to verify directly from a bank's balance sheet. Analysts have to rely on the bank's calculations for those measures. That's why analysts are beginning to favor a simpler measure: tangible equity capital, often abbreviated as TEC. TEC is shareholders equity less intangible assets, both as reported on the balance sheet. Divide that into total assets to get the TEC ratio, a direct, efficient measure of a bank's capital position. Let's see how it works on a real bank, PNC Financial Services Group. The emerging standard for an adequately capitalized bank is a TEC ratio of at least 4%. PNC's Tier 1 ratios are much higher than its TEC ratios, but the bank still meets the TEC capital standard -- as long as you ignore the fair value of its loan portfolio. In 2008, PNC had $2.95 billion in unrealized losses on its loans. Under the fair value rules, those losses would still be unrealized as long as the bank treats them as assets held to maturity. But PNC is required to disclose those losses in the notes to its financial statements. 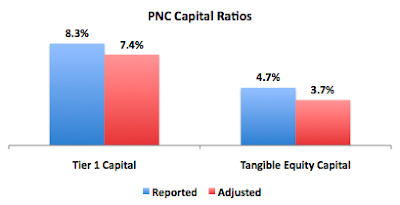 If we take them into account and use adjusted ratios, both PNC's ratios fall, and its capital doesn't look so healthy. Financial reporting is loaded with confusion and uncertainty, and never more than when the rules are changing. Financial analysis is a struggle against the darkness with a set of imperfect tools. When the rules are changing and key measures aren't working anymore, it's still possible to get at the economic reality by trying new measures and making thoughtful adjustments. Loans to non-investment grade and middle-market companies are typically secured by the borrower’s receivables, inventory, and fixed assets. 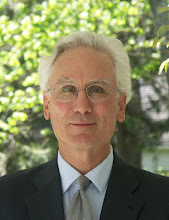 Pledging this collateral, however, does not reduce the borrower’s likelihood of default. Security should reduce the loan’s loss given default, but not necessarily in the way you expect. Here’s how. Banks that make secured loans do not expect to foreclose on the collateral to repay the loans. Loans are typically repaid from cash flow from operations or by refinancing with new debt. Foreclosing on collateral is a last resort. 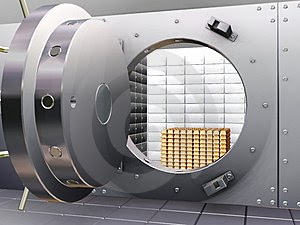 Some lenders, such as those that provide asset based loans, equipment finance, or mortgages, are expert in disposing of foreclosed assets, but most banks are ill-prepared to seize assets and sell them. Most secured lenders to bankrupt large corporate and middle-market companies never take possession of their collateral. Instead, the companies are reorganized or sold using the bankruptcy system (e.g. Chapter 11 or Chapter 7 in the U.S.). Proceeds from the bankruptcy, either cash or new securities, are then distributed to creditors. Secured creditors have a higher priority when these proceeds are distributed, giving them lower losses than unsecured creditors. Does Collateral Mean the Loan Will Be Repaid? Unfortunately not. Even if the value of the collateral exceeds the amount of the loan when it is made, it is likely that the value of the pledged assets will be substantially lower when the borrower is in financial distress. After all, an asset is only worth what someone will pay for it, and, as we’ve seen, many assets decline in value in a recession. As a lender, by all means take collateral when you can get it - just don’t rely on the collateral as your primary (or even secondary) source of repayment. Instead, analyze the company’s ability to generate cash flow to repay its debt. Remember, taking collateral doesn’t mean the company or its assets will retain their values. Unless you are an asset based lender, the biggest benefit you get from collateral is that it moves you to the front of the line in a bankruptcy.